Blackday in Dolpo, 3 Juin 2014..., désigné aussi comme "le massacre de la Tarap". En complément de l’article sur Yarsagumbu, voici un témoignage de Tashi Tewa Dolpo… Pour ne pas oublier les réalités dramatiques provoquées par cette ruée vers l’or. « 3 juin 2014, jour fatidique dont personne ne voudrait se souvenir. Il était environ 4 heures du soir quand, après avoir échoué à faire respecter et considérer notre requête, nous nous sommes rendus à la maison de Jampa Lama pour récupérer le fruit des taxes du yarsakumbu collectées par nos villageois il y a quelques jours à Sisol et subtilisées par les états-majors de la zone tampon (du parc Phoksumdo), soit la somme de 7.65 lhaks (765 000 roupies). Je vous invite à lire TARAP n°46 d’Octobre 2014, le journal de l’association « Action Dolpo ». I am Tsering Furwa, one of the locals of Dolpa. Most of you may have already forgotten who I am. When people don’t care about those who are alive, who mulls about the dead? When I look back at myself and think of my dead body, many unfamiliar things come into my mind. At that last desperate moment, I recalled my pregnant wife and children crying aloud. How helpless was I? … I could not even hold the tears of my own Aangmo and children. Is it time or State that makes a person like me helpless? I tumbled to the ground. All parts of my body in endless pain. I feel one of my eyes is out of the socket. I cannot even see properly. My lower stomach is also in severe pain. Blood is flowing from my head, eyes and mouth. That might be the reason why Aangmo is crying endlessly. Her embrace gave me that indescribable warmth for few minutes, but I am not able to hold on to that love. I am stranded like a dead fish. Within a minute, my whole body became cold as I took my last breath. I felt as if something just passed by. My Aangmo became alone and she kept on crying. That day and that event are still fresh in my memory. Aangmo had woken up early in the morning without disturbing me. She had already returned back after releasing all the livestock on the other side of the hill. I am still sleeping. Butter tea is also prepared and Khura, a bread of buckwheat, is made ready as a meal for me. The buckwheat, which we always prepare for many months by singing, sweating and whistling together on our land, and many great memories are made in those moments. I wait for the month of July to harvest buckwheat and when we can finally rest for a while before I again start my journey for Yarsa. She is used to making some Khura for me during my journey with some chili pepper. To keep those breads warm, she puts it in a woolen cloth, and the bread always stays warm even during the cold days. That’s how she never fails to express her unconditional love. Yesterday until 6 pm I was picking Yarsa on that other side of hill called Sisoul. I was tired and woke up late… The cold breeze coming from the river Bheri touching my chest, gives me great pleasure, but when the worm is found, the pleasure finds no words. Yesterday I found forty worms in total. Meanwhile, in the village, every person picks at least twenty worms and some collect and sell them later. Some sell them to the traders of the village at three to four hundred per piece and at least five hundred to eight hundred rupees are charged for a better and strong worm. Some sell them during trading times at the border. During that time, a huge festival takes place at the other side of a border, Maango, Tibet. Sherpas from the eastern region come here to pick worms, this year from early June till late August. Last night, Temba also came to my home to have dinner after picking worms in Kalang and Lulang. He told me that around eight thousand people have arrived in the village this time. Each person has come here only to pick worms, but we have restricted them from picking worms in Kalang and Lulang. These places are grasslands for our livestock. Last year, other people picked the Yarsa without care and nearly destroyed the grasslands and we could not provide grass for our herds. Many yaks died early. The early death of yaks is similar to our demise. Therefore, from this year, as per our customary rules under Gapu, we restricted others from picking Yarsa from those particular hills. Gapu is the main person of our village. He and a few other important people made the decision with the consent of the peoples. Temba returned home after discussing the restriction with me. He told me to meet him tomorrow at the same place where we usually pick worms. I guess it was about seven in the morning. Tying a woolen cloth on the hip while carrying a small spade on my hand, I am ready to go. I walked to Kalang to pick worms when Aangmo was busy feeding the children. How she finds and manages times both for me and our children only she knows. We always share our dreams together for our children too. Meanwhile,we are only allowed to pick Yarsa from eight in the morning till six in the evening as per the customary regulations of the village, and if somebody picks before or after that time, then he or she will be penalized. I started to pick worms. Then, I remembered my childhood days, playing with my friends, sheep and yaks. That was a brief pause… In those days, there were no obligations to pick the Yarsa, like today. I can only remember Amchi Namgyal from the neighborhood using Yarsa to prepare his herbal medicines. There is no hospital around so he and his medicines are our last resort for a safe health whenever we become sick. Sometimes he also gave sweets that he brought from Kathmandu when we gave the worms to him. Maybe the price of a worm was one sweet at that time. I used to break that sweet into pieces with a stone and share it with Temba, but now, it costs around three or four hundred rupees. That may be the reason why the people, including children from lower Dolpa, come here to collect the Yarsa and also shut down their schools. The sun reached right above my forehead. I could only collect fifteen Yarsa. I started to imagine so many things and stayed without collecting the Yarsa. Suddenly, Temba came running towards me, calling ‘Furwa, Furwa’ and in one breathe said, ‘Jhyampa has charged three thousand each from the Yarsa collectors from outside. He also allowed them to collect the Yarsa from Kalang and Lulang ignoring our decision. Our own community’s amount of equal to eight lakh rupees and the receipts were also forcefully seized by the management committee’s people’. 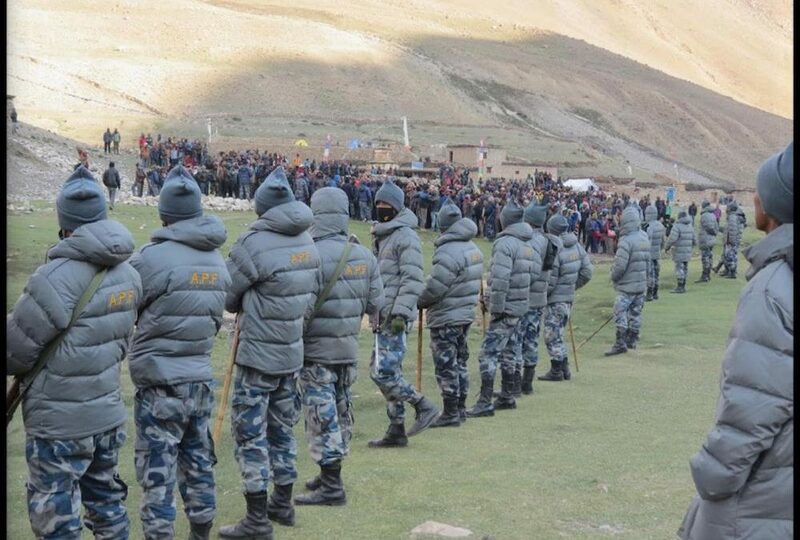 The committee has brought fifty armed police forces from Dunai, the district headquarter. All villagers had already gathered in one place. Everyone was there including the committee people, security officials, Jhyampa and others. They are in no mood to listen our voices and experiences. Outsiders, mainly officials, were drunk and relaxed in the hotel of Jhyampa. They were having fun and their loud voices could be heard outside, but the sound of Bheri River kept on increasing and villagers were getting angrier. By that time, we all went to Jhyampa’s hotel kicking the floor. Then, we requested, in-front of Jhyampa, Why did he do that? We even asked him, ‘who asked you to do that?’ At the end of the day, he is also one of our own. Maybe being a businessman might have convinced him to act otherwise. The villagers even asked the committee to return back the money and receipts. Some villagers were also angry with the behavior of Jhyampa and the people of the committee. I was watching it all and I found it unbearable. Jhyampa and the committee people did not concede to our requests. ‘Do what you can do’, and with that statement they even threatened us to put us in jail. At that moment stones were thrown and within a second a gun was fired piercing the long held silence. It was the first time gunshot was heard in the village. Lhakpa used to tell me about guns being fired down in the lower region of Dolpa during the time of the Maoist Insurgency. My body used to shiver even at that time, but now when the gunfire is heard by my own ears, we all get scared. In no time, we all ran away. The migrant birds also took flight, flapping their wings along with us. I don’t know where Temba was. Everybody looks after themselves when death comes knocking. After half an hour of running, I hide myself and took a long breathe nearby a small cave. It’s about to get dark. I can clearly hear the police shouting in anger. They were shouting loudly. For some seconds, I again felt like freezing when I remembered my Aangmo and my children. My eyes filled with tears, but then again, I ran away. I had no choice. Darkness did not left me alone ever. Not even a moment had passed when a gun was fired nearby. I don’t know where it was, but suddenly I felt intense pain. I couldn’t even run. Even the moon used to light up the place before but now only darkness loomed in-front of my eyes. The uneven sounds of boots approached nearer and then stopped for a while. After that, saying ‘aren’t you the same Bhote who ran away’, they fiercely hit me by the gun’s barrel. I felt I will surely die when my aching body was further tortured with by battering. I cried and yelled, ‘ah, ah’. Sadly, nobody listened. Though even friendly Gyurme, Gyaltsen, and other friends are used to talking with me whenever I was angry, this time nobody heard. I didn’t know whether I died or fainted. After a while, I thought I woke up again from that last sleep. My Aangmo and my children were crying ‘father, father!’ I felt great remorse for my wife and my children as I ultimately failed in-front of death. After I was declared dead, silence reigned in the village again. When a helicopter finally arrived the day after my death, somebody even asked for a post-mortem of my body, but the people were threatened by the distance to Dunai and the legal and dark courthouse. So, by midnight, my body was cremated. Nobody protested. After two or three days, Dhondup Lama also passed away after succumbing to fatal blows from the police. Aangmo became all alone and may have been thinking, ‘the body of my children’s father was not even given a proper burial as per our tradition. Some piety at least could have been earned only if his body’s flesh were fed to hungry vultures,’ and then, my Aangmo’s other mind may be thinking, ‘My Furwa is not dead, he is murdered!’ She may then be trying to console herself as she feels the children close-by and her baby inside her womb. It’s been more than a year since I have been declared dead. By preparing a fake document of my death, they called it an accident due to a fall from a hill while cutting grass when the truth was that during that season there is no grass to be cut. It has been more than a year when twelve innocent Dolpo people were threatened with life imprisonment in Suligaad (an army barack of Dolpa) if anybody goes against the police and reports by saying I was murdered. In more than a year everyone has hushed up. It has been more than a year since so called the defenders of my society and country have declared ‘injustice won’t happen to Furwa’. It has been more than a year since she started crying and her tears haven’t yet stopped. It has been more than a year that my children have been hearing from their friends, ‘your father is not coming back’. I don’t even know what will happen to them… I don’t know who will tell them that I am shot down by the security official of the state who promised to provide security to us. I don’t know WHO will give them JUSTICE ??? or IT’S JUST A SWEET WORD ??? Above is the translated article in English, which was before published already in Nepali. For the Nepali version, please do follow the link: http://np.recordnepal.com/perspective/65.